Superheroes Dominated the Kids Costume Category This Halloween Season. Photo by: Presidio of Monterey, via Flickr. Plan on dressing up for Halloween this year? According to the National Retail Federation, almost 7 in 10 of those planning on celebrating Halloween are planning on wearing a costume this year, and when it comes to costume choices, while it may feel as though the choices are seemingly endless, many of the top Halloween Costumes for 2017 are timeless classics in all three categories - kids, adults, and pets! While there's always fun new fads and trends each year, there are certain Halloween costumes that have become iconic favorites of Halloween lovers each season.This year in the children's category, Superheroes & Princesses dominated, taking the #1, #2, #4, #7, #8, and #10 slots (some of which represent entire categories, some of which represent specific heroes and princesses). 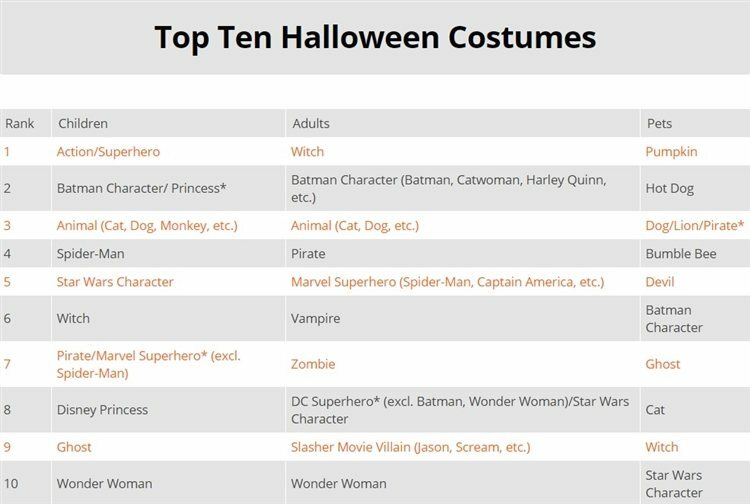 Also popular in the Kids Costume Category were some beloved classics, including "Animal" at #3 (which encompasses all animal costumes), "Witch", which came in at a respectable #6, "Pirate", which tied at #7 with "Marvel Superheroes, and "Ghost" which came in at #9 for the 2017 Halloween Season. In the Adult Costume Category, superheroes again rained supreme, taking the #2, #5, #8, and #10 slots, although many of the more "traditional" Halloween costumes ranked highly, including "Witch", which took the #1 slot, "Pirate", a favorite of kids & adults came in 4th in Adult Costumes, "Vampire", which came in 6th, "Zombie" followed closely behind at #7, and "Slasher Movie Villain" came in at #8. In the Pet Costume Category, many of the costumes were more of the classics, and a few "pet specific classics", which have become popular with dog owners and other pet lovers across the country. Top picks includes Pumpkin, which ranked #1 yet again - "Pumpkin" seems to be the go-to pet costume for Pet Owners in the US, "Hot Dog", an increasingly popular costume for dogs over the years came in at #2, and the #3 spot had a 3-way tie between "Dog, Lion, & Pirate". Most interestingly, up until last year, "Holiday Bowties, Bandanas, or Fancy Collars" ranked in the top Pet Costumes, but as Pet Parades and dressing up Fido for Halloween becomes more popular, this "costume" has fallen off of the top 10 entirely! The National Retail Federation released the above chart as part of their "Halloween Headquarters" Halloween Retail Report for the 2017 Halloween Season. Are You Planning on Dressing Up This Halloween? Will Your Kids & Pets Be Participating Too? What Will You Be Dressing Up as for Halloween 2017?